These are the blocks that I assigned myself for May, following the schedule I started in February. I also fixed up a few problems I had with the colors and blocks for April. Pretty soon I will be able to get to the June blocks, hopefully before the calendar flips to July! We have copies of the Gypsy Wife Quilt book at the store, so give us a call (651-429-1039) if you want to sew-a-long! You can start anytime it fits into your schedule. The Row By Row Shop Hop starts across the nation in just a few days. The official start date is Sunday, 6/21, but since that is Father's Day we will not be open. We will kick off on Monday AM at 9:00. Our pattern, designed by Laurel, is called Walleye Chop. It fits in well with the "Water" theme. The pattern is our gift to you, but you must be physically present in the store to claim it. That is part of the Row by Row Book of Law for all shops. 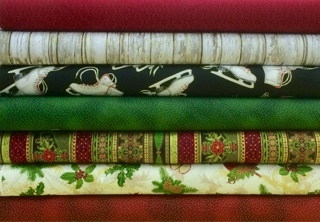 Kits are available for purchase if you want the same fabrics that were used in our sample. They are packaged in this nice little zipper bag. And in case you aren't familiar with what Walleye Chop means, I have to tell you that it's not some kind of chopped fish meal! It's a reference to the somewhat choppy waters on a lake that are favorable for catching walleyes, quite possibly the best fish to come out of a Minnesota lake! If you are traveling to Minnesota from another state, try to find a place that serves some good walleye. I had a great walleye meal at Gluek's Brewery in downtown Minneapolis before a Twins' game, it's real close to the stadium, so you could have walleye and a Twins game all at once! Anyway, back to the Shop Hop! We have some Row By Row souvenir pins, and a special acrylic ruler that is a very handy size (you might want more than 1, so get yours soon!). And tshirts and caps will be on hand very soon, so you can be fully outfitted in proper Row by Row attire! I have to say that for me, personally, these prints are so much more appealing than last year's. They would go so well with the fabrics in our row! And finally, our license plate! 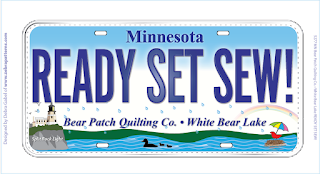 Our order for these plates is still being printed, and we will need to take orders for them so they can be mailed out once the shipment arrives. I think the slogan says it all! Happy stitchin' to all of you, and enjoy the Row by Row Shop Hop! 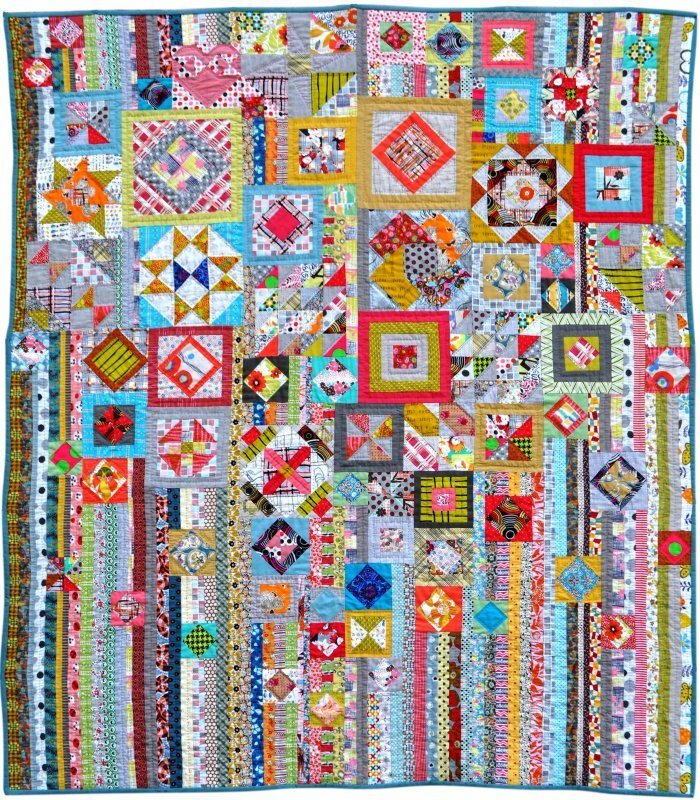 Do you know about the nationwide quilt shop hop? 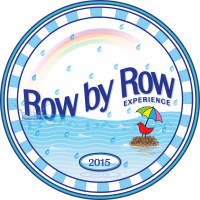 It's called the Row By Row Experience and runs from June 21 to September 8. It is an organization of shops from all 50 states and Canada, too, that have signed up to participate. As a participating shop, we have created our unique row design, only available when you come to Bear Patch. The pattern is free, one per customer. We will also have kits available to purchase for our row. 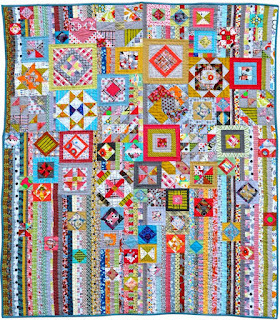 The goal is to collect the patterns and create your own quilt of at least 8 different rows. 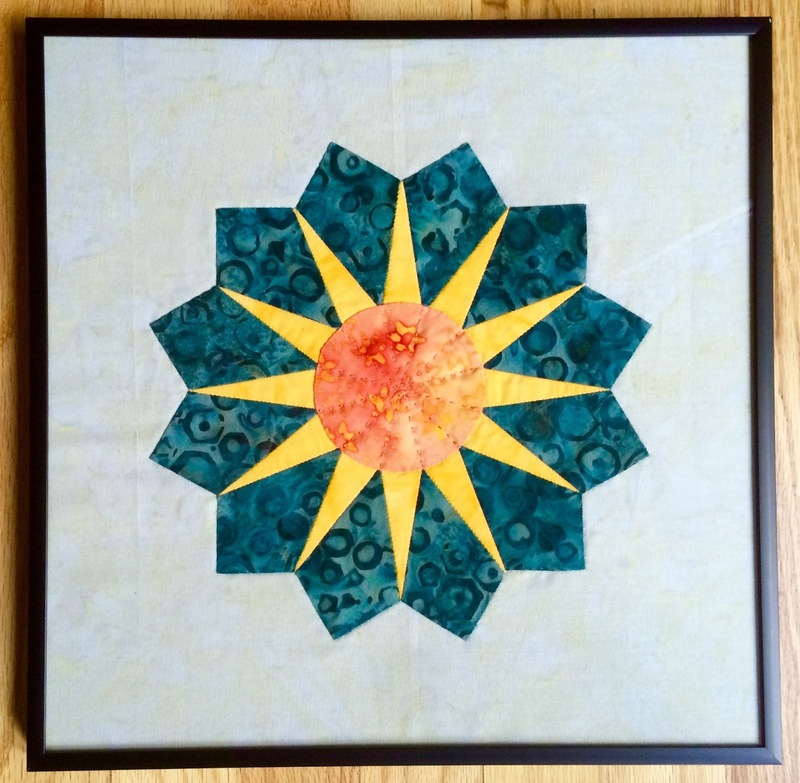 There are prizes for winners who bring their completed quilt to a participating shop. All of those details are explained on the Row By Row website, as well as a directory of shops. 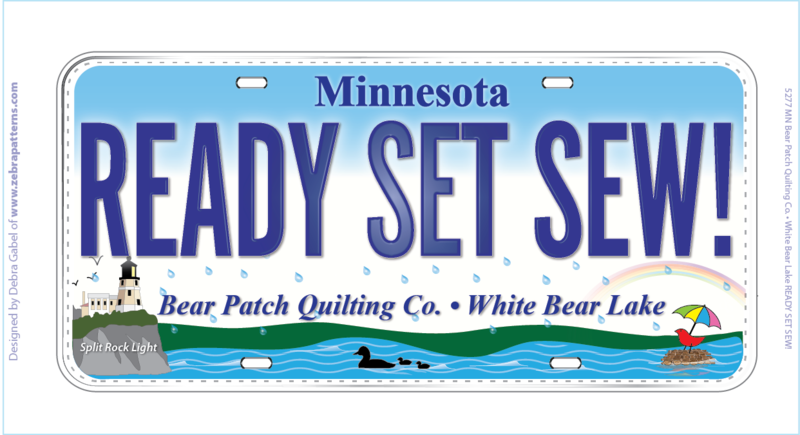 Another fun feature of this experience is the chance to collect fabric vanity license plates from each of the stores. Can't wait to see what all of the fun quips on the plates will be! *After July 30 we will return to our usual 9-9 Thursday hours. Last Tuesday, we had a special treat in the store. One of our fave ladies brought something unique for "show and tell"! This work of art was made by Alice from 1/2" hexagons with the English Paper Piecing method. That's a lot of little pieces! I didn't measure it, but I think it was about 4 feet tall. It was framed under glass, so that's why you see some reflections in it. The frame itself was another part of the art, since it was made from floor board planks from her grandma's 125 year old farmhouse. Thank you so much for sharing, Alice! 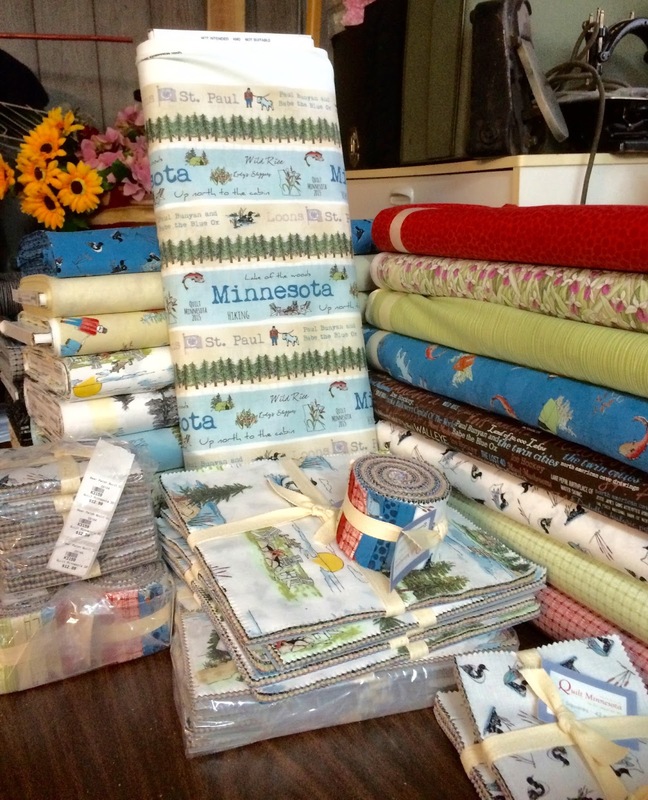 It's time for preparations for Quilt MN and I've been back at the drawing board. 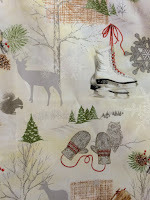 It's always fun to be given the chance to put together the specially designed fabrics with a picture in my head. I've been busy at the keyboard and EQ6 to put the images together on a screen. Today I actually got to the point of cutting and sewing the real stuff! The quilt pattern will be easy, I promise, and make the most of the designated fabrics. I am making the sample in a size that is nice for a couch or recliner during an afternoon siesta, or anytime you might want to get snuggled up! 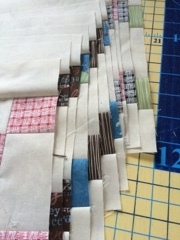 Usually, as I have made these Quilt MN quilts, I have written the directions for only one size of quilt, then later, as time permits, I have added on some additional sizes. This time, I might just be ahead of the game! I have calculated yardage and some of the cutting for larger and smaller sizes, too. I'm checking and re-checking my numbers, since I'm not going to make the quilt in every size, even though that would be the best way to verify that all my numbers are correct. So stay tuned for a bigger bed quilt and maybe even a little MN baby quilt! 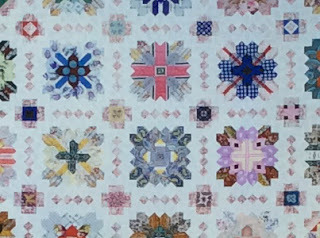 We will be busy making up kits for the quilts soon, so look for that information, too! I never did very well on those ice skates as a kid, it was much more challenging to stay upright than what it looked like on the Olympics! Maybe the fact that the pond was in the cow pasture didn't really help! And, our much awaited first shipment of Quilt MN 2015 fabric is in the store! We can take pre-orders for any of the yardage, plus 5" squares, 10" squares and 2 1/2" strip packs. We just have a couple bolts of each right now, enough to put some out on the shelf and cut more for our store samples in the works. I have been working on another exclusive pattern for these fabrics, which will be available for purchase soon! Along with a kit, of course, if you choose! It's only on paper and scrap fabric so far, but I will be ready to cut and sew the real stuff before long. That's if I get more progress made on our little home improvement project with my husband! We are replacing carpet with laminate wood flooring in a loft area of our home, and my evenings and some weekend time has been focused on moving this along! This is in part due to the fact that everything that had been on the loft (desks, computers, storage, shelves, etc.) is now crammed into my sewing space! Makes it look like an episode of the Hoarders in there! So I am motivated to get this done and get my space back! 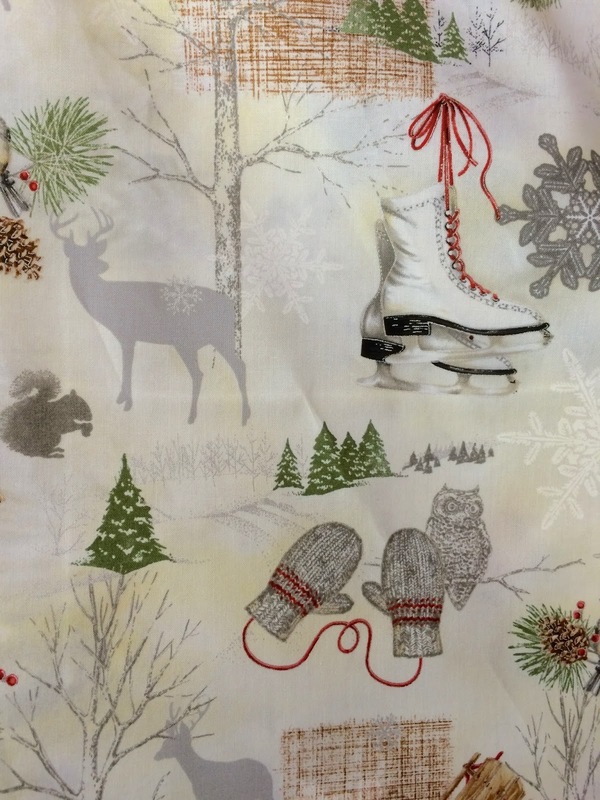 Call us (651-429-1039) to order your Minnesota fabric!